It was a day of tension and mixed results for Vancouver Whitecaps’ Residency teams on the final day of group games at the USSDA playoffs at a wild, wet, and windy Westfield in Indiana. Both the U16s and the U18s headed into their final matches knowing that their postseason fate was firmly in their own hands. A win for both and they were through to next week’s knockout stages. 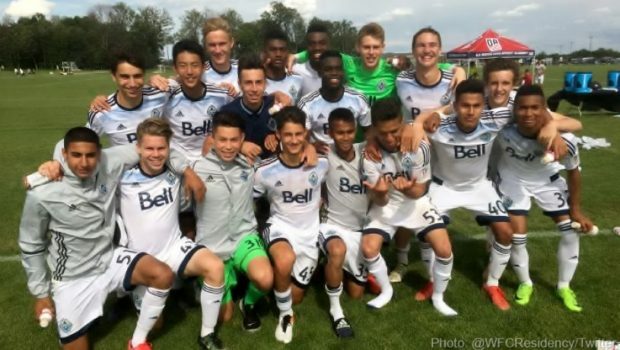 Hopes were high that both sides would advance to the quarter-finals for the first time but as the drama unfolded, it was only the U16s who still have a shot at glory and a first national title for the Whitecaps. The 16s were in action first in their final Group C game against LA Galaxy, in what proved to be a rollercoaster of an afternoon between that match and the other group game between Philadelphia Union and Houston Dynamo. It was always going to be a tough task for the U16s in their all-MLS academy group, but as top seeds of the four (8th overall) the hope was that they would get through after some expected battles. And battle they did against LA (seeded 15th overall), fending off two Galaxy fightbacks to secure a 3-2 win thanks to a Keisean Brooks goal seven minutes from time when it looked like Houston were set to win the group. Jose Hernandez got the ‘Caps off to the perfect start, picking himself up after being felled in the box to slot home the penalty for his fourth goal of the week and his 22nd of the season. But the Galaxy fought back to level in the 22nd minute when Jake Arteaga finished a lovely passing move with a nice finish and throw the group wide open once again. That was how it stayed until half time, thanks to a fantastic save from ‘Caps keeper Evan Ince in the closing moments, and with Philadelphia Union leading Houston 1-0 to stand atop the group, Vancouver needed to score again in the second half to advance. And they did just that only two minutes after the restart when Jefferson Alade poked home a loose ball in the box from a yard or so out to put the ‘Caps back in pole position. It was a lead that was to last only 12 minutes before Jonathan Estrada poked one home for LA, but with Houston levelling Philadelphia, the 2-2 scoreline still favoured Vancouver. The goal gave the Galaxy a boost and Man of the Match Ince produced a couple of fantastic saves to keep the ‘Caps in it as LA pushed hard. But then the group standings swung once more with the Dynamo completing a stunning comeback to go 2-1 up on the Union and the wildcard team were now unexpectedly on top of the group. Once again the ‘Caps had to score to reach the quarter finals. They needed a moment of magic and it came from Brooks, who powered forward to get on the end of a sublime Alessandro Hojabrpour pass through a crowd of Galaxy players to drill it home from just inside the box. The final seven minutes and stoppage time were nervy, but the ‘Caps saw it out with relative ease to clinch their third quarter-final berth in the last four seasons. With other results, and some top teams crashing out, the ‘Caps are now seeded fourth and will host Seattle Sounders U16s next Thursday in a Cascadian derby. Kick off time and venue to be announced. It was sadly a completely different tale for the U18s, who were blanked for the second straight game, going down to a 1-0 loss to Real Salt Lake AZ to end up finishing third in their group. Despite dominating possession, there was a distinct lack of quality in the final third from a stacked U18 team that started four USL signed players. They just couldn’t find a way through a resolute RSL defence and as the conditions worsened, so did their chances of advancing. The death blow came in the 71st minute when RSL crashed a shot off the post from distance, but Erik Virgen buried the rebound, also from distance, to give the Arizona based academy a crucial 1-0 lead and subsequent win. It will certainly be a major disappointment to all involved with the team, as that U18 national title continues to be elusive despite the talent coming through the program. At least we still have some playoff action to look forward to. Our Residency Week got somewhat derailed this year due to an incredibly packed weekend of MLS, USL, and PDL matches, so we’re turning it into a Residency Fortnight instead! Lots of good stuff still to come.